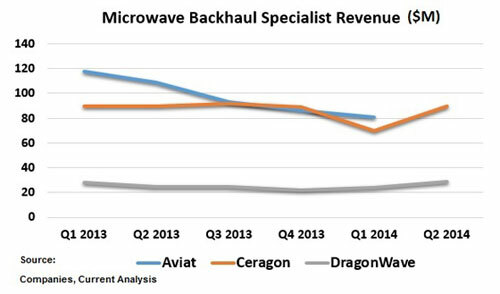 Hearing insider reports yesterday of a round of layoffs at one of the microwave backhaul vendor specialists was another reminder of how challenging that space has been in recent quarters, something we’ve examined in our analysis of the sector. A harsh competitive environment and notoriously fierce pricing pressure has left equipment vendors wondering how their competitors could be making any money. A glance at top-line trends (see chart) suggests that they aren’t. Very recently we’ve seen some hopeful signs of improvement in the segment (again, see chart). Still, vendors are looking for any way they can to combat competitive pressures by adding value to their offerings beyond that of the microwave links themselves. For example, some vendors point to professional or managed services to assist with rollouts. Some point to Layer 2 or Layer 3 capabilities that are integrated into the microwave solution for greater performance and even potentially reduced site rental costs due to compact designs. Vendors with broader portfolios (e.g., major RAN vendors) point to end-to-end offerings with smooth interoperability between various network elements and in many cases the convenience of a common network management platform. Specialists, meanwhile, argue that their solutions offer best-of-breed performance, with advanced features promising maximum capacity. One operator we spoke with recently argued that one of the temptations of the specialists may be that – with microwave backhaul sales their only revenue source — they’re simply “hungrier” to win deals than major RAN vendors are, and thus more attentive. In the current environment, though, everyone seems hungry. We’ve seen restructurings, public offerings and layoffs this year alone. Talk of consolidation in the near term is common. All of this makes operators understandably nervous about betting on the wrong horse and investing in a supplier that may fall under new management within the next few years. Operators are always exposed to the impact of vendor M&A, of course. And in this case, such combinations could affect the above-mentioned value propositions that are driving many of today’s vendor selections. For operators hoping for more long-term visibility in this space, the sooner vendors’ woes reach critical mass and force M&A, the sooner clarity comes. Thus, some operators may see the recent relief in some vendors’ top lines (have I mentioned the chart?) as an inconvenient forestalling of the inevitable. When everyone’s hungry, nobody’s happy. Things only get better once somebody starves. Previous postItsOn: Is It On or Is It Off?